In the Roanoke Rapids Reservoir in the northern Piedmont, extensive excavations at the Gaston and Thelma sites found a broad range of Middle Woodland artifacts and numerous archaeological features. Excavation plan of Area F at the Gaston site showing Woodland features and palisade posthole alignments (Based on South 1959a:269). At Gaston site were pits containing human and dog burials. The human remains, with one exception, were tightly flexed and placed in simple oval pits. 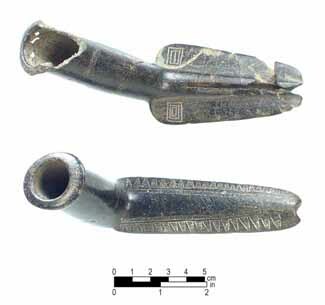 Only one burial contained an associated artifact: an engraved stone pipe made from chlorite. Stone pipes found during excavations at the Keyauwee (top) and Gaston (bottom) sites. Three primary ceramic traditions were found at the Gaston site - Vincent, Clements, and Gaston. Vincent pottery was near the bottom of the midden, whereas Gaston was concentrated near the top. Clements sherds appeared to be scattered throughout the midden. Vincent Fabric-Marked (bottom left), Clements Cord-Marked (bottom right), Clements Fabric-Marked (top left), and Gaston Simple Stamped (top right) rim sections from the Gaston site. Vincent and Clements ceramics were assigned to the Early and Middle Woodland periods, whereas Gaston pottery was thought to have been made as late as A.D. 1700. 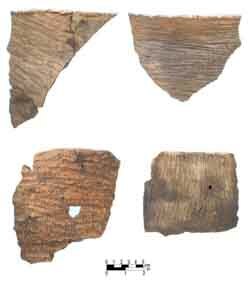 A seriation of Vincent, Clements, and Gaston series pottery from features at the Gaston site (Based on Coe 1964:100). Vincent pottery consists of bowls and jars with straight to slightly flaring, undecorated rims. Bases are usually pointed, but sometimes rounded. Clements pottery is similar, but the cord and fabric finishes on Clements pottery are finer and vessel walls are thinner. The Vincent ceramic complex probably overlaps with the first half of the Yadkin phase in the southern Piedmont. Clements phase probably dates to the end of the Middle Woodland period. Evolution of Woodland pot forms in the lower Roanoke valley (Based on Coe 1964:107). Small, stemmed "Thelma" points showing continuity with Late Archaic points were found with sometimes found with the Vincent ceramics. Otherwise, large and small triangular points were generally associated with Early and Middle Woodland materials in the Roanoke Rapids Reservoir.